Today was fun fun fun! In our attempt to pare down our clutter, we decided to rent a table at a local flea market and sell some things (for a change). I LOVE going to flea markets and it's rare that I can't find something I have to buy. (My idea of heaven is the flea market at the Porte de Clignancourt in Paris - miles and miles of STUFF)! But no, today we were on the selling side. We were de-cluttering and sales were steady. We met a lot of people, chatted about the goods on display, collectibles and antiques....all in all, a good time. Of course even though we were selling, it would be totally crazy to pass up an interesting find. 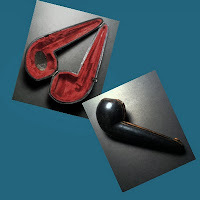 I did come across an old pipe case that I liked. No, I don't smoke a pipe. I don't know anyone who smokes a pipe. But it's old and interesting and really, how much room does it take up? Hardly any space at all! So I bought it. Oh yes, and a Bavarian cup and saucer. Again, it goes in the china cabinet and we have a china cabinet anyway so there would be no point in passing up such a nice item for $2.00. I admit it. I'm a junk junkie. But overall, mission accomplished. We emptied bags and bags of things from the house, and rented a table again for next month. Maybe I'll be selling a pipe case and a Bavarian cup and saucer. But for now, I'll enjoy them. I do love me a good flea market..very hard to find here. My idea of traveling and seeking out flea markets would be ideal, you just never know the cool stuff you would find. PS I hope yu had a chance to enter my giveaway. Seems flea markets are getting harder and harder to find. I think all the on line auctions are causing sales to dip. 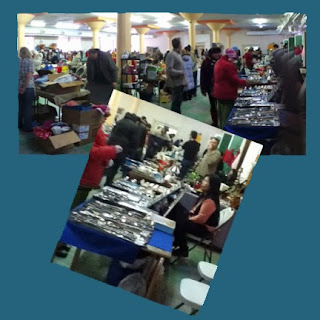 I'd love to travel around in the summer from flea market to flea market looking for treasure! (Will check out the giveaway - thanks for the reminder)! My village has a big flea market every summer where anyone in the village can setup a table. I was so mad at my husband last year because he failed to tell me about it and it would have been a perfect opportunity for a clear out (we had moved house only a week before!). I'm definitely getting a table this year! Bonjour! I know I'm just a show off! I came by to say hello, thank you for commenting on my last post and to catch up on soem of your posts. For some time now I havebeen convinced I followed your blog and 'quelle surprise' apparently I do not. Well I have resolved that by signing up immediately. How come someone who adores Paris (I used to work in the Bois de Boulogne - please do not snigger!) and loves this blog is not a follower? Anyway I am now one of your adoring fans. I loved flea markets when I lived in Paris. However as we are now a 'junk free zone' I no longer buy just browse when I get the cahnce. We're off to france again soon so I shall no doubt be checking out the 'brocante' sales. Lovely post. It took me back to happy days. I'm off to catch up now. By the way - the dress I treated myself to is not only fabulous but French! Sara Louise - wish I could haul my left over stuff to France and join you in selling at your village flea market. Hope you can take some photos! Carol. Lucky you living in a junk free zone. What's it like? And you're off to France soon! Wonderful! I'm so jealous! And a French dress, and working in the Bois de Boulogne, and and and....I hope you'll be writing about your trip on your blog (which I love). Thanks for the visit! Bisous!